GSS has been designing and manufacturing web transports for inkjet applications for over 15 years. We have manufactured over 100 inkjet transports ranging from 18” wide to 52” wide and speed from 500 to 2000 fpm. We manufacture web inkjet transports for providers like Kodak or sell directly to printers who buy inkjet systems from other providers such as Kodak, HP, Kyocera, Xerox, MCS, etc. Our servo driven web tension control knowledge as well as our partnership with Adphos to dry the ink, makes us one of the most experienced inkjet presses manufactures in the world. In addition to the design knowhow, we have a world class manufacturing facility to produce cost efficient, high quality equipment. Our ability to meet the EU directives means we can design and manufacture presses that can be installed throughout the world. In additional to complete inkjet presses, we offer inkjet towers that can be integrated onto existing web presses for hybrid offset/inkjet printing. These towers can be configured to print monochrome or process color at press speeds. We offer custom designed and manufactured web inkjet transport units to meet the most demanding requirements incorporating a variety of inkjet printing systems. We recently designed and our currently manufacturing Kodak’s Prosper 6000 inkjet press. 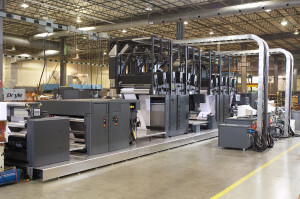 This press can print full duplex color on a 26” wide web at 1000 fpm.